It’s nice to work at a place so heavy involved in contemporary art, on my dinner last week I was able to take a look at this insightful exhibition; Mountain Arts. I wasn’t expecting too much, as with such a distinct theme, my mind raced to the usual culprit; the landscape drawing; something I’ve come to expect here in the Lake District. Again and again though I’m being proven wrong. Like me, many artist’s in this area are overcoming the desire to paint a representational image of our neighbouring landscape. The artist which stole the show for me was most definitely Brian Thompson. His beautifully crafted sculptures, captured the beauty of our enormous mountain ranges. He challenged me to consider portraying the landscape in a more unusual way. Sculpting and model making came rushing back to me, encouraging me to get making again. The titles of Brian Thompson’s work really spoke to me too. He described a journey in his titles, his large central piece titled: To Easedale Tarn by Emma’s Dell. In describing a personal detail of the journey we relate to the voyage of his mountain climb. We reflect back on our own mountain adventures. The other artist’s I’ve included in the photographs are Lucy Devenish and Hamish Fulton. Devenish uses a favourite tool of mine; a map. Again focusing on a journey, a place in time. Lucy depicts a personal place. St Non’s Bay. Hamish’s work follows his own journey through Walk texts on Wood. Depicting a mountain range in text and objects. After seeing the exhibition I want to show my journeys, be it in sculpture or in a map based drawing. We’ll see. One thing I mentioned briefly, a couple of blog posts ago, was Lisa Selby’s show With and Without, however I never got round to blogging about the fantastic artist talk which she gave at The Surface Gallery all the way back on the 9th of May. I was amongst just a select few of the artist’s “fans” as she gave an extremely personal talk about the selection of works exhibited in With and Without. I found the artist herself particularly down to earth and really appreciated this about her. She spoke about her work in such an easy manner which I easily related too. Her work was such an inspiration to me. I spoke about her artist statement before- particularly this sentence- “Selby rearticulates items from the domestic environment, relaying the familiarity and alienation experienced as one moves physically and psychologically from one home to another.” As I said her work relates so closely to mine, so I was so excited to hear her speak about it! Some interesting research Selby mentioned was something I studied at English Literature A level- it’s a short story called The Yellow Wallpaper. I have a feeling this might be key to something next year so I need to track that down from some old notes I think. Also Sylvia Plath was mentioned so may have to crack those books out too! Selby soon began to talk about the shift from home to home and the impact this has on us. For instance she spoke about the objects we choose to take with us, the ones we keep. Why do we keep some and not the others? What are those objects we lose from our lives? She spoke about the build up of layers on an object- something I’ve been thinking about for awhile. Can there be such thing as a neutral object? She spoke about the titles of the work too which is something I have been tackling in my work. In my latest piece – “In every dwelling, even the richest, the first task of the phenomenologist is to find the original shell.” I hoped I had intrigued the viewer with this philosophical sentence. However Selby made me realise that this may not be the case, I’m more likely to be alienating the average viewer- distancing them from the work. The viewer can be intrigued by the title without using big fancy words. One last thing I want to mention was Selby’s carpet piece- “Dance me on and on”, I enjoyed that whilst listening to her artist talk I discovered a lot of Selby’s sculpture had huge personal meanings behind them. These meanings are kept secret from the viewer and the piece becomes whatever the viewer sees. I’ve been slightly afraid of doing personal work at uni- unsure as to whether others can relate to personal work? But Selby showed me that it can be done. “Dance me on and on” was one of those personal pieces that had such an endearing meaning. 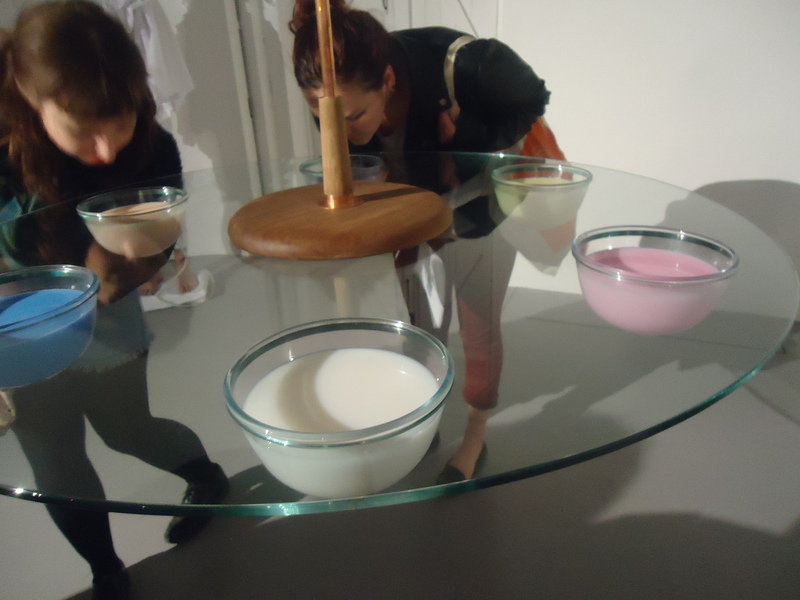 Selby explained that this piece commented on the association with song, dancing, drinking and having a good time with a lover. But when that lover has left you repeat the drinking and the dancing to forget those moments. The red wine spilt on the cream carpet shows not only that but Selby also comments on the pristine way we want to keep our houses. Surely those stains of red wine are the signs of a person living a life in that house? Mark making their life. Needless to say it sounded like the perfect exhibition for me! Selby had an interesting approach to the sculptural aspect of her practice. The way she transformed found objects into something unknown could really influence my work. I enjoyed the slight interaction needed by the audience in her piece “For the comfort of others.” whereby the audience leaned in to smell the familiar smells of various washing detergents. This week’s F.A.N workshop was Sculpture. We weren’t sure how the pupils would react to this task. It was quite “out there” for them, we only gave them descriptive words to work from and a whole load of materials to play around with and create something loosely based on the words describing natural forms. You know what though, they really enjoyed it! They got on with it straight away- got creative and went with the flow. This proves how far they have come from the first session, if we’d given them this task in the first week there’s no way they would have let loose so much.